As the driving force behind Cold Specks, Al Spx has been through a lot in the past couple of years. Her 2012 debut I Predict a Graceful Expulsion, earned a Juno nomination and made the Polaris Prize short-list, cementing her international fan base with a deeply personal doom-soul sound. Before long, Spx quickly grew frustrated with the sparseness of those early songs, so the 2014 followup, Neuroplasticity, looked to fill in the space with more expansive arrangements. Her live show at the Imperial on November 25 seemed to reflect this transition. Their hour-long set kicked off with "The Mark," the opening track from her debut, performed with Chris Cundy on bass clarinet, while Spx sang and played electric guitar. Joined by guitarist Tim D'eon, drummer Loel Campbell and producer Jim Anderson on bass and synths, Spx put down her guitar as they launched into "Let Loose the Dogs" from Neuroplasticity. Spx seemed reluctant as a performer. She showed flashes of character on "A Broken Memory," used expressive hand gestures during "When the City Lights Dim" and shuffled about oddly on her platform boots, like St. Vincent is prone to do, as she belted out the wordless crescendo for "A Quiet Chill," but whenever it looked like she was going to take it over the top, she'd pull it back a shade. Her banter came off a little uncomfortable. There were some notable bits as she mentioned how fucked up America was while expressing thankfulness to be back home in Canada, told the crowd to buy her merch or die and said that "Nicky Poo" is a name they like to call Nick Cave before their cover of "We Know Who U R," but instructed the audience not to tell anyone since they don't actually know him. For the most part, though, she'd merely say what the next track was going to be and perhaps mumble its theme or some gratitude. It felt like she was holding back. And yet, Spx had nothing to fear. Her voice was incredible, nailing her gospel-indebted vibrato that drips with emotional resonance. Requiring no lavish embellishments, she went a cappella a few times, doing a bit of "A Season of Doubt" and, most strikingly, reworking the lyrics for "Holland" to include the refrain of the Ferguson protest slogan "Hands up, don't shoot!" With the rest of the band crouched in their positions, Spx sang "Blank Maps" solo as she played electric guitar. She showed spectacular ability, and her band was excellent. Everyone but Campbell switched instruments frequently to keep the arrangements fresh, with Cundy alternating between baritone saxophone and bass clarinet and D'eon crossing the stage to play the bass at Anderson's station. They were notably explosive and enrapturing in their delivery of recent single "Bodies at Bay." The encore hammered home the gravity of it all, though, as she finished with an a cappella version of the traditional song "Old Stepstone," capped off by another refrain of "Hands up, don't shoot!" 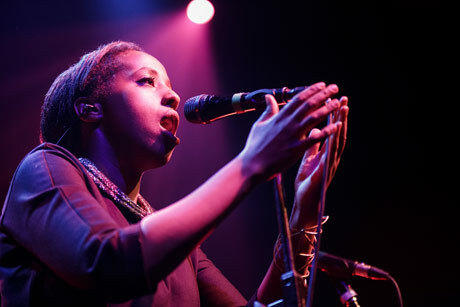 If she can get to a point of truly owning her style in a live setting, Cold Specks are going to lay waste onstage.